The intelligence was called “Ultra’’—because it was so highly secret—and it consisted of intercepted and later decoded radio and cable messages sent by the Nazis to their clandestine networks in Europe and South America during the war. Ultra was launched by British intelligence in 1941 and ultimately became a cooperative Allied effort. The FBI learned of Ultra in November 1942 and was immediately interested because of its implications on investigative efforts during the war. They gave the intelligence they were able to obtain through Ultra another name—“Ostrich.” The code name was arbitrary, but the information it provided was anything but. The intercepted messages—whether decrypted by British cipher experts, U.S. Army and Navy code breakers, or the new and rapidly improving cryptanalysis team in the FBI Laboratory — were invaluable to our work to protect the homeland from German espionage and sabotage. The Ostrich information was often hard to come by. In those days, secrecy was paramount and cooperation was just beginning between the FBI and overseas intelligence services like the British Secret Intelligence Service, now more commonly known as MI-6. But through the Bureau’s newly formed legal attaché office in London—headed by Special Agent Arthur Thurston and his assistant, John Cimperman—the FBI began reviewing the British decrypts at MI-6 in January 1943. The bits of intelligence related to possible German espionage on U.S. soil were passed to FBI Headquarters and then on to Bureau agents for action. The information was especially valuable to their work in South America, where in June 1940—under orders from President Franklin D. Roosevelt—the FBI had set up the Special Intelligence Service, or SIS, to pinpoint and neutralize Nazi spy rings and intelligence activities in the Western Hemisphere. It helped them, for example, in Argentina, where a network of secret Nazi radio stations had sprung up after being shut down in Brazil in 1942. With the help of Ostrich messages decoded both by the British and by cryptanalysts in the FBI Laboratory, the Bureau learned of the strong political influence and extensive intelligence activities of German agent Johannes Becker, mapped out the operation of his ring, disrupted its work throughout the war, and later shut it down completely in the summer of 1945. Without Ostrich, the FBI would not have been as successful in pinning down the extent of Nazi espionage in South America through the SIS. On a broader level, Ostrich intelligence enabled the Bureau to control the movements of its double agents and ensure they were successful in penetrating German intelligence. It was, in the end, one of the FBI’s most significant sources of intelligence in World War II. Of course, as the war ended, so did the information stream provided by Ostrich and Ultra. But the lessons learned would continue on—most especially in their efforts to penetrate Soviet intelligence in the coming Cold War through cooperative cryptanalytic ventures like Venona. Today, such pioneering information-sharing initiatives are now widespread and widely recognized as key to the work of the FBI and its global partners in protecting the world from terrorists, spies, and dangerous criminals. 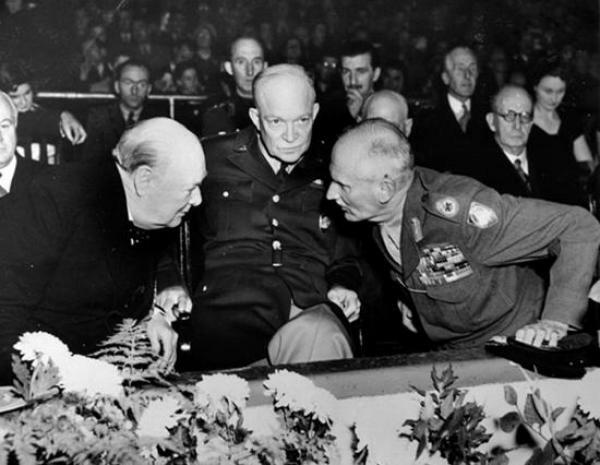 Image: American General Dwight D. Eisenhower; his British Deputy Field Marshal Bernard Law Montgomery shown here at a reunion of the British Eighth Army on October 19, 1951. Churchill, leaning across a seemingly disgruntled Eisenhower, would again become Britain's Prime Minister five days later.